I was happy to see this addition to the app and I was disappointed it was not already included in the basic Apple Health or Mi Fit apps. But my experience with the Mi Fit app is that it only differentiates light sleep and deep sleep not REM so is Mi HR using its own algorithm to determine the sleep state? Also does the alarm work in the background or does the user need to have the Mi HR app and/or Mi Fit app running when they go to bed? MiBand 2 as MiBand 1s uses its own algorithm to determine the sleep stage. It is known that is checks Your heart rate and movements during sleep. No, You do not need Your iPhone nor MiHR app running when You use smart alarm. You just set it and the MiBand 2 remembers the set awake time and wakes You up at that time or nearest light sleep just before the set time. How did You like smart alarm? Did it change anything in Your waking up? Hello, the Smart Alarm function is not working at all for me. I set up the alarm to 9:30 am and no vibration at all. Also tryed different times during daylight, nothing again. What should I do ? Alarm it’s on, so as the app and bluetooth. Need a solution, please! thanks for mentioning this issue. Yes, unfortunately at the moment smart alarm on MiBand 2 does not work. We are trying to make it work and I will let You know on this blog when it is possible. I am sorry for the inconvenience and ask You for some patience. Tried to set smart alarm with my Iphone 6 and Mi Band 2 (FW ver. 1.0.0.23). It didn’t vibrate at all. And ordinary alarm also didn’t work when I tried it out. unfortunately at the moment smart alarm works only with MiBand 1s. We work on making it possible with MiBand 2. Hopefully we will manage to do it and I will write about it replying to Your comment! Any good news about MI Band 2 & Smart Alarm on iOS? unfortunately, not at the moment. I will infrom You there on the blog when we manage to do it. do You mean iOS or MiHR final beta? yes, the possibility to set measurement frequency on iOS is one of our priorities. Coś jest nie tak z smart alarmem. Nie reaguje na zmianę ustawień godziny, opaska budzi mnie i starej godzinie. To raz. A dwa – mam ustawione powtarzanie alarmu od poniedziałku do piątku, jednak notorycznie nie zaczyna budzić w poniedziałek, tylko w środę. Więc ma 3-4 dni bez budzenia mimo innych ustawień. Dodam, że inne alarmy nie są ustawione. czy korzystasz z MiBand 1s czy MiBand 2? Jaki system na iOS? Opaska to mi band s1, a system wcześniej ios9, teraz ios10. Dziękuję za odpowiedź i przepraszam za zwłokę z odpowiedzią. postaram się dowiedzieć się, co można zrobić i dam znać już na maila. So is smart alarm working for mi band 2 now?? unfortunately, at the moment not. I will let You know when it is. Hellow! When smart alarm will work with Mi Band 2? At the moment smart alarm works only with MiBand 1s. It is hard to predict when it is possible with MiBand 2, as it is connected to some programmer issues. I will let You know when we manage to solve them! I was very satisfied with my mi b.2 and your app on android, „unfortunately” I now got an iphone from my employer and this rendered my band close to useless. lost full control over all app notifications and as you mentioned before the smart alarm still does not work on the 2nd version. Any chance you will add support for controlling notifications as the standard Mi app doesn’t even cover half of them? Any progress on the smart alarm? thanks for good words and for the question. Yes, we plan to support smart alarm on MiBand 2. I will let You know when it is possible. Regarding notifications on iPhone – we have added it to the feature list. Which notifications would You like to have on it? If You have any further ideas or questions, please let me know. do You know whether there is any other app that works on iPhone with MiBand giving notifications that would satisfy that requrements? Hello, I try to get the alarm working but no way it won’t vibrate at all. There are no other alarms set in other apps. I using iphone5 with ios 10. The app is working because sending vibration is possible. thanks for Your interest in MiHR and for the question. Are You able to measure Your heart rate in MiHR app? Miband 2 and heart rate is possible to measure. thanks for the response! Unfortunately, at the moment smart alarm in MiHR works on with MiBand 1s. We will hopefully manage to support it at MiBand 2 in some time. If You have future questions, please let me know. 1. Czy zostanie przywrócona w jakiejś najbliszej aktualizacji? 2. Czy jeśli nie zostanie przywrócona, otrzymam zwrot pieniędzy? W trakcie zakupu nie było mowy o tym, że ta funkcja nie jest wspierana. Wręcz przeciwnie. czy jest to MiBand 1s czy MiBand 1? korzystasz z iPhone czy z Androida? czy chodzi Ci o zakup apki MiHeartRate czy opaski? Pisze ponownie w sprawie nie działającego smart alarmu przy opasce mi band s1. Aplikacja nie reaguje na zmiany godziny budzika! Dopiero z kilkudniowym opóźnieniem zauważy że godzina budzenia została zmieniona, nie licząc kilku wyjątków. Problem zgłaszałam we wrześniu – do dzisiaj nie dostałam obiecanej odpowiedzi na maila. Zakupiłam wersję premium tylko przez wzgląd na smart alarm… a okazuje się że budzenie w oryginalnej aplikacji byłoby lepsze mimo braku smart alarmu… ale chociaż miałabym pewność że mnie obudzi. Witam, Agnieszka, tak, rzeczywiście, jest taki problem. Nie wiem tylko, dla czego nie otrzymałaś odpowiedzi na maila. Wysłałam maila z zapytaniem, czy w MiFit też alarmy są wyłączone jeszcze 20 września. Odezwij się proszę, na support@mimhr.com w tej sprawie, ponieważ ustalenie budzików w Mi Fit może zakłócać pracę Mi HR. Dzięki i przepraszam za niedogodności! ostatni mail, który wysłałam, właśnie dotyczył budzików w Mi Fit. on dotarł? czy dobrze rozumiem: problem z inteilgentnym budzikiem polega na tym, że jak Pani zmienia godzinę budzika, ta zmiana jest wykonywana dopiero po 1-2 dniach albo też zdarza się, że budzik nie dzwoni? Hello I buy the prenuim version of your application to use the smart alarm but it does not work on my mi band 1S the alarm sounds just on time … Should make adjustments so that the smart alarm works ? Thanks for supporting Mi HR development and for the question. Smart alarm should work fine on iOS with Mi Band 1s. Could I ask You for how long time have You been using it? Hello! I also have problems with smart alarm on iOS, using mi band 1s. It dosent work at all, how can I fix it? Hello, Stepppler, thanks for the question and sorry for inconvenience. Please let me know what You mean that it does not work: do You manage to set smart alarm in Mi Heart Rate app? does it wake You up at the set time or before it? is Your Mi Band 1s connected in Mi Heart Rate app? Are You able to measure Your heart rate in Mi Heart Rate app? 3) yes, band is connected – I get info about my pulse, also I get vibration in the settings. how often do You change the alarm time (I mean how much time usually pass between You installed the alarm and it should awake You)? could I ask You to try to reinstall Mi Heart Rate app and to reconnect it in Mi Fit app. Hello! If I correctly undersood your question, passed about 8-9 hours. we will try to fix that. Когда сможете сделать умный будильник, работающий с mi band 2? К сожалению, вряд ли в скоромо времени. как только сделаем – сообщу! I just tried this app with mi band2 and the smart alarm did not work as expected. It rang at the time set and not earlier, even though I was awake before that. Are there any know issues with it right now? Is there a way I could check what exactly does the band memory has(alarms, time, smart or not and so on)? How does the sync between the app and the band happen? There is no progress bar nor „button” to trigger sync. I will check the issue with smart alarm. In order to check what the band’s memory has (alarms, time, smart or not and so on) I would suggest You to check the apps connected to Your Mi Band (e.g. Mi Heart Rate, Mi Fit apps). When You tap on connect in settings menu of Mi HR app, it is connected to Your Mi Band and when You measure Your heart rate, You receive the data in Mi HR app. Mi Band does store not hr nor cadency data and this is the data Mi HR shows from Your Mi Band. Thus, there is not need for any synchronisation. At the moment, when Mi HR is not running, it is not connected with Mi Band, even though once You run Mi HR, You may find Your Mi Band connected in Mi HR or You may need to connect it manually. If You have any future questions, please let me know. Could I ask for some more information regarding Your experience with Mi HR: I am interested whether You liked it and why. I’m using an IPhone SE, IOS version 10.1.1. I have purchased the Pro version, is useful for third apps which require HR monitoring, so congratulations for your work. Didn’t try yet the smart alarm, but could get the alarm working with Mi Band 2. AFAIK, the band vibrates 18 times, 3 times each interval, 6 intervals, I didn’t check if the alarm repeats if you ignore it. The problem, at least for me, is that the vibration is so soft and short that I’m unable to notice it. Do you know some way to increase the length or the intensity? yes, the possibility to set kind of vibration is added to the feature list. I will let You know once we manage to introduce it. if You have any future ideas or issues, do not hesitate to let me know. 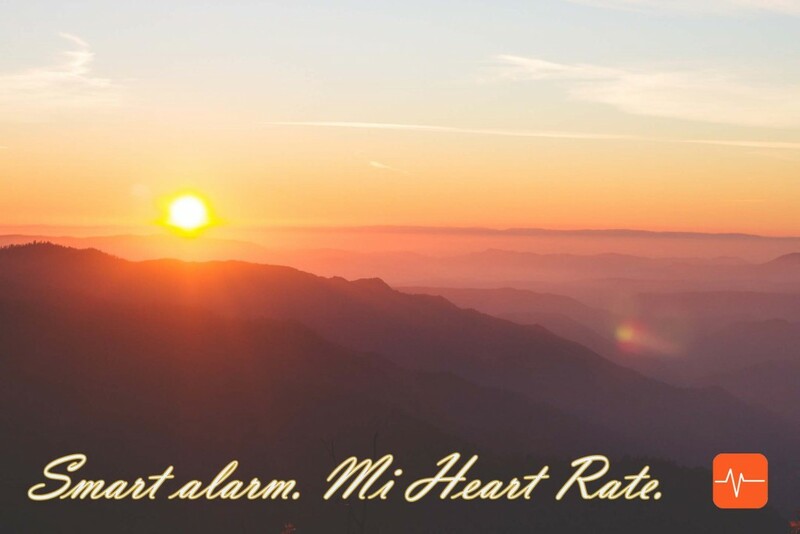 I hope You will find Mi Heart Rate useful! Overal the app is good and but one will still need to get mi fit app to have all features like steps tracking and activity. One thing that bithers me now is that I had mi hr app only on my iPhone. Few days later I wanted to install mi fur app, but I fail to pair it with tha mi band 2. I tried to disconnect it from mi hr, but it still did not want to pair with mi fit app. I will try to reinstall the apps now. Btw smart alarm still did not work as expected even that I had no other apps even installed that use the band. Your help is much appreciated to get the smart alarm working. Anything on the smart alarm feature? It still works as regular alarm on mi band 2. It is worthless to use the app for this feature today. You must fix it as it is one of the features we pay for. Приветствую, Юлия, благодарю за Ваш интерес к Mi HR и за поддержку его развития. К сожалению (как тут пишем), умный будильник работает только в версии Mi HR для Mi Band 1s (iOS). добавление умного будильника для Mi Band 2 очень трудное по техническим причинам. Если хотите, сообщите мне transaction ID на support@mimhr.com – сможем вернуть деньги за покупку. Не могу спарить свой браслет первого поколения без пульсометра. Программа его видит – нажимаю спарить, вылезает окошко „соединяюсь” и все ничего дальше не происходит, минут 5 ждал и ничего. Хочу что бы работал умный будильник. благодарю за Ваш интерес к Mi HR и за вопрос. к сожалению, Mi HR работает только на Mi Band 1s и Mi Band 2 (версии с пульсомером). а умный будильник – только с Mi Band 1s. Если у Вас появятся новые вопросы или идеи относительно развития приложения – милости просим! Hello, I am thinking about full versinm od the app but I can see that the Band 2 does not support smart alarm. I would like to kindly ask if this feature is all ready working? If now do you have clear plan of providing this function; meaning you know what is a problem and only time for implementation is needed? thank You for the interest in Mi HR and for the question. yes, unfortunately, at the moment smart alarm works only with Mi Band 1s. Mi Band 2 support is at the feature list. However, it is connected to some technical issues and it is hard to predict when we manage to do it. Once it happen, I will let You know. Feel free to ask any future questions concerning Mi Heart Rate app or to let me know about the ideas in this regards You have! Умный будильник будет работать на mi band 2? Hello! I would like to know when smart alarm mi band 2 will work on ios? thanks for the question and sorry for the delay with the response. We had some issues with server. regarding smart alarm on Mi Band 2 – unfortunately, we do not plan adding it in the nearest future, because it is connected with some technical difficulties. if we manage to do it, I will let You know. feel free to let me know about any future questions or ideas You have. Czy istnieje możliwość odzyskania płatności za aplikacje Mi HR, zakupiona w sklepie Apple? Kupiłem aplikacje wyłącznie ze względu na smart alarm, który, jak się okazuje nie działa, i nie jest planowane wdrożenie tej funkcjonalności. Poprzedni Poprzedni wpis: MiBand 2: будет ли он считать пульс правильно?